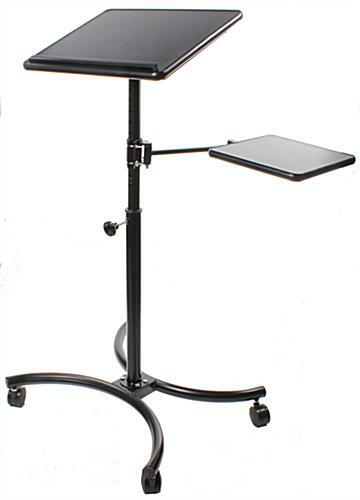 This Laptop Stand is Ideal for Retail Use! This Display Allows Users to Change the Angle of the Work Surface! This Laptop Stand Looks Great In Any Setting! Height adjustable up to 55" high. Surface tilts to a 25° angle. Extra shelf for additional work space. This laptop stand has an extra shelf for storage space. 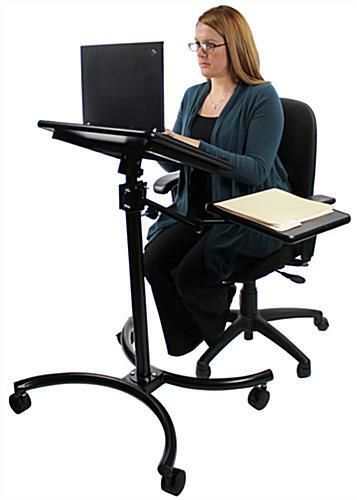 This ergonomic computer stand is height adjustable. 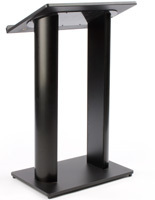 Use this multi-shelf laptop stand for presentations, or lower it so it can be used as a workstation. These desks feature a shelf that attaches below the work surface. 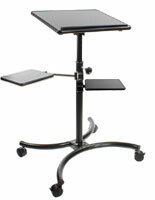 The additional shelf on this adjustable arm laptop stand can be moved to different heights and locations. The 20.5" axel and elbow joint easily allow the shelf to be repositioned, and the clamp is easily removed to be set at different heights. This laptop stand that has an ergonomic design has an adjustable surface as well. This display is height adjustable. 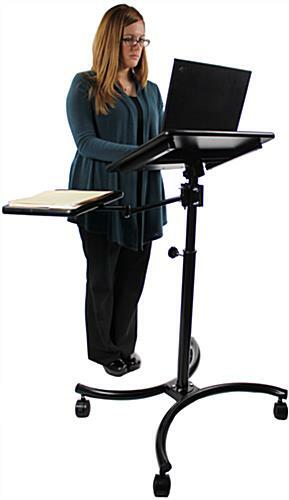 This laptop stand that's for presentations is easily maneuvered. Four caster wheels are at the bottom of the base. 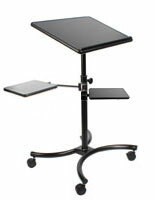 This ergonomic desk, laptop stand has (2) of the wheels lock when needed to keep this unit stationary. With a 20" x 16" surface and an additional 12-1/8" x 12-1/8" shelf, there is plenty of room to store any work or presentation tools needed within arm's reach. 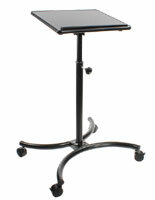 This laptop stand that has a sturdy black base has a matte black finish that will complement any décor or finish. 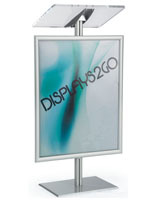 The curved design of the base is very contemporary and will liven up any trade show setup, cubicle, or home office. 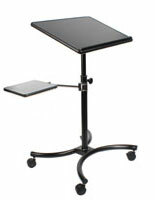 With so much versatility this laptop stand is an excellent addition to any commercial or residential setting.